JJC CL-A16K Sensor Cleaner is specifically designed for cleaning APS-C frame CCD, CMOS. JJC CL-A16K contains 12 pieces of sensor cleaning rod for APS-C frame CCD, CMOS. Each piece of sensor cleaning rod adopts vacuum packaging. The cleaning tongue adopts V shape design which can effectively reduce the contact with the sensor. Made of high quality microfiber, the cleaning tongue features a high dust-attracting power. The cleaning tongue not only wipes away dust and dirt, but also leaves no lint after cleaning. Besides, the width of cleaning tongue is 16mm which is exactly the width of APS-C frame sensor. 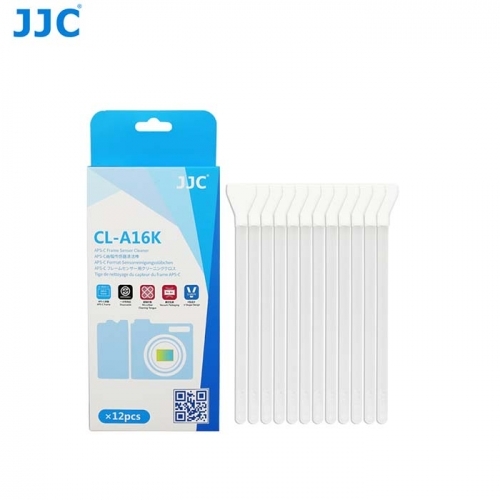 JJC CL-A16K Sensor Cleaner is also suitable for cleaning other delicate devices’ surfaces including smartphones, keyboards, LCD screens and eyeglasses.